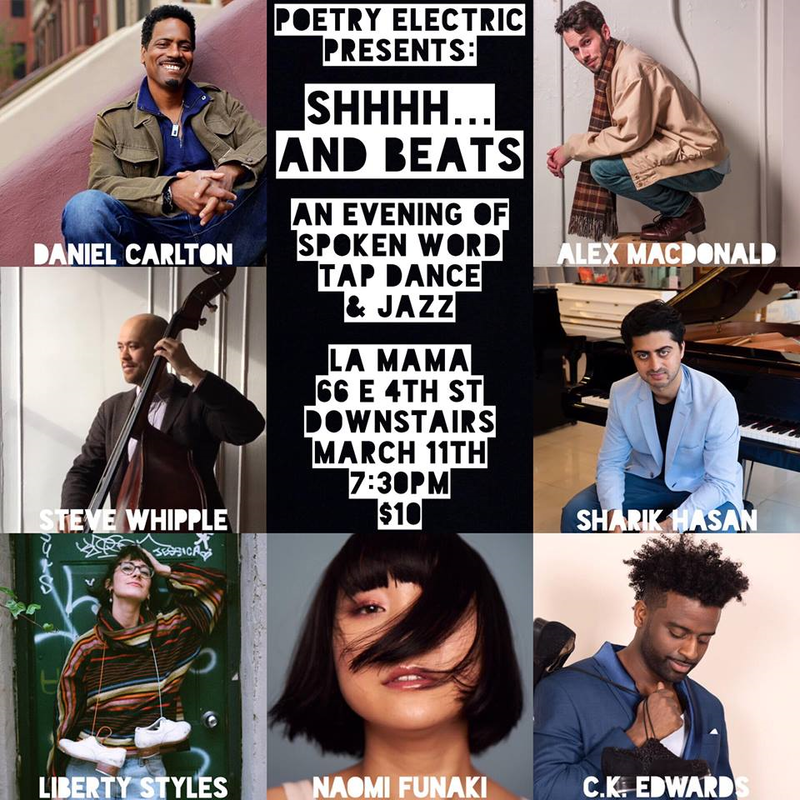 Shhh... and Beats is an ongoing collaboration between poet Daniel Carlton and tap dancer Alex MacDonald. Blending elements of spoken word, tap, and jazz, the work seeks to chronicle the vibrations of NYC and the never-ending quest for quietude. Special guests include bassist Steve Whipple, pianist Sharik Hasan, and tap dancers C.K. Edwards, Liberty Styles, and Naomi Funaki. I'm thrilled to travel to Nigeria with Tim and the Space Cadets to offer a series of concerts and workshops for internally displaced children in Lagos and Abuja! We are very fortunate to make this special journey through the support of the United States Embassy Community Engagement Project. Hitting the road with PMJ for a quick winter tour through Europe!! Hope to catch you in one of these cities! Donning the jumpsuit and goggles and hitting the kids music stage with my buddies in Tim and the Space Cadets at Lollapalooza this year!! Come hang with us in Chicago for some family fun!! Dancing the choreography of my dear friend, Felipe Galganni, on Friday, April 21st!!! Excited to perform alongside some very talented dancers, singers, and instrumentalists. Spring is here in NYC and Jobim is the perfect soundtrack!! Featured Artists: DJ DOC, Kim D. Holmes, Alexander MacDonald, Andrew J. Nemr, and more to be announced soon!! We get together for a night of beautiful improvisation. The evening begins with a formal sharing by featured artists. After the formal sharing, artists share their process, craftwork, and feelings around improvisation, responding to questions from the audience. After the last question the lights go out, the chairs are cleared, the floor is opened, and the music starts…the party begins. The divide between audience and artist is torn down. All are welcome on the dance floor. Hitting the road once again with my old buddies in Postmodern Jukebox! This will be my first time in each of these countries, so I am quite excited. :-) Come check out the show and I promise to tap my heart out! Southeast Asia dates coming soon! Hello friends!! Super excited to be dancing once again in the annual Rhythm in Motion series, curated by Tony Waag and the American Tap Dance Foundation. This year, I will be dancing the choreography of Caleb Teicher in Program A and Felipe Galganni in Program B. Many great choreographers and dancers sharing the bill - come check it out!! Very excited to be a speaker/performer at this year's TEDxFulbright event at the Smock Alley Theatre in Dublin, Ireland! The theme of this year's event is "Old Myths and New Realities." More info on how to attend coming soon. Meantime, feel free to read the abstract for my talk below! Tap dance is an American oral tradition and one of the oldest art forms to come out of the United States. Embedded in its beautifully intricate rhythms and footwork are the stories of African Americans forced into enslavement, attempting to hold onto their culture despite all efforts at its erasure; as well as the stories of Irish immigrants, fleeing the Great Famine and facing prejudice abroad. If necessity is the mother of invention, it might also be said that adversity is the mother of tap dance. As an oral tradition, the form has long been transmitted from one generation to the next without the use of written language. Dancers are often very aware of their tap lineage, knowing precisely who mentored their mentors’ mentor. Movement material is learned and passed on through observation, repetition, andvisual/aural mimicking (sometimes affectionately referred to as ‘stealing steps’). Physical proximity between dancers was traditionally a crucial criterion for this process. Today, we find ourselves in the age of smart phones and social media. Tap dance may be recorded, produced, and published for global consumption entirely via the modern miracle of mobile devices. We are simultaneously more connected and less connected than ever before. Physical proximity is no longer a prerequisite for learning steps, but do the steps truly translate when divorced from the stories they carry? How do we continue to learn from the struggle that begat this beautiful art form, while living in a newly accelerated age of transmission? Crucially, how do we harness the power of our technology to both innovate and honor our traditions? This engaging and performative talk will offer some possible answers to these inquiries based on the personal experiences of the speaker as an ethnochoreologist and professional in the field of tap dance. Tim and the Space Cadets are joining forces once again with Mother Falcon to play on the Austin Kiddie Limits stage at the 2015 Austin City Limits Festival!!! Look to see yours truly in a brand new burgundy jumpsuit!!! Dates and set times coming soon!!! I will be joined by Matt Cusack on bass, Matt Garrison on Sax/Clarinet, and Anna Crowley and Christiana Shorter on backing vocals. Come for the music, come for the food, but mostly come for the hang! Come by Hyde Sunset in Los Angeles, CA every Wednesday this fall season to catch the Postmodern Jukebox Speakeasy Series!!! We will turn the hottest lounge in West Hollywood into a 1920s hang and I will be play duel roles of MC and tap dancer for the show!!! Going to be a hip hang. Can't wait to see you there!!! Tap dancing with Scott Bradlee and Postmodern Jukebox at Musikfest in Bethlehem, PA! At it again with Postmodern Jukebox, tap dancing along to some jazzed up versions of contemporary hits! Check us out as part of the Bemus Bay Pops Concert Series in Bemus Point, NY!! !